SkyDrive, or should we say OneDrive, is Microsoft’s solution to the cloud. The end goal is simple: They want all Windows 8 and 8.1 users to use SkyDrive as a means to connect between computers, mobile devices, and gaming systems. The integration level of SkyDrive into Windows 8 and 8.1 has made some consumers cringe. The Smart files feature was one of the biggest additions to the Windows 8.1 update. Here’s how they work. In case you didn’t already know, SkyDrive is automatically included in Windows 8.1. You don’t have to install it anymore and if you want to uninstall it, good luck is all we’ll say. 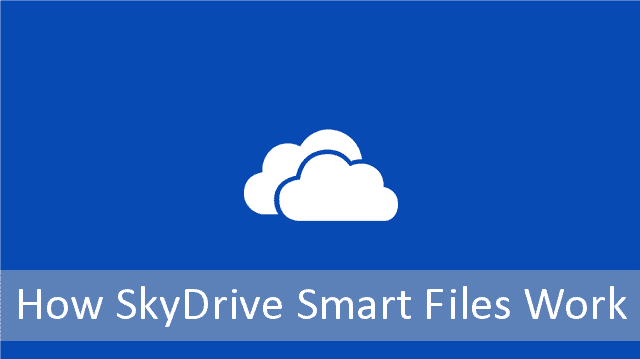 Smart files is a feature added to Windows 8.1’s version of SkyDrive that allows a user to pick what files are synced to all devices connected to the SkyDrive account. This means that you can filter out what’s important that you need it everywhere and leave everything else synchronized to individual devices and computers. In theory, this is a great feature. Hint, hint Google Drive. However, there are some flaws, too. Not so smart now, right? If you open SkyDrive and right-click on any file or folder, its menu will open on the bottom of the screen. Click “Make online-only” to make the file or folder online only. From there, you’ll need to download the file locally anytime you want to use it. After making that choice, you can then make it an offline only file or folder, too, depending on the computer you’re using. This allows you to make the choice of whether or not files are stored online or offline. Depending on your computer or devices, this can make the difference in conserving space when necessary and gives you control over what SkyDrive does for you and your data. SkyDrive is still a bit funky to use in Windows 8.1 because of the modern app layout, but once you get the hang of it, the smart files feature can come in handy. Personally, I use Google Drive for just about everything because I trust Google more than I do Microsoft with my data. However, I’ve slowly started using SkyDrive to test out features, speed and functionality and smart files is a step in the right direction. With the changes coming to SkyDrive launching as OneDrive, we’ll see how Microsoft truly handles the integration of its cloud service across multiple computers, mobile devices and gaming platforms in the future.